David Tennant has become the most successful debut contestant on BBC Radio 4's quiz show Just a Minute. The actor made it through 60 seconds without repetition, hesitation or deviation. Tennant managed to talk about Shakespeare's stage direction "Exit, Pursued by a Bear", without once being interrupted. It is the first time in nearly 50 years of the show that a contestant has made such a fluent debut. 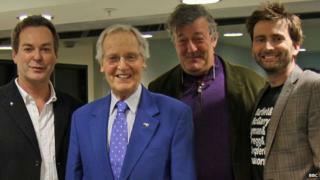 The Doctor Who and Broadchurch star was asked to go on the show by host Nicholas Parsons, who thought his "natural delivery" would be ideal for the show. After hearing Tennant's effort, Parsons congratulated him, saying: "A newcomer, coming on in this very difficult game, we make it sound easy for the listeners. And it is very difficult. "Well done… I think you can relax now David." Unfazed by his triumph, the actor joked: "Can I leave now before I ruin my record?" The episode, broadcast on BBC Radio 4 on 9 February, saw him join Stephen Fry, Julian Clary and Paul Merton for the Just a Minute challenge. The long-running quiz show, which began in 1967, sees contestants challenged to speak for one minute "without repetition, hesitation or deviation". A spokesman for Radio 4 said the Just a Minute team could not recall any other example of a newcomer making it through a full minute on their first attempt, saying it was "very possibly" the only time it had happened.